This post is going to talk about two subjects but they both kind of tie in together. 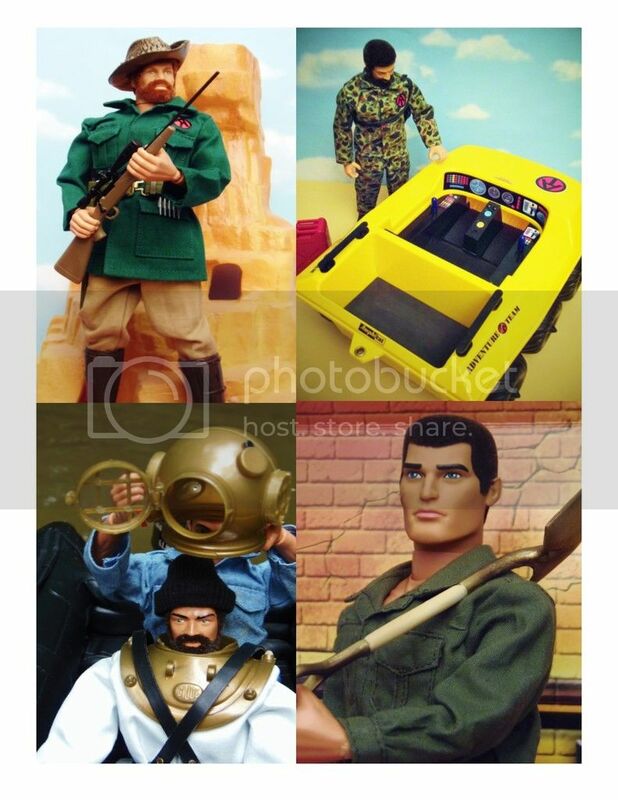 As a kid, I grew up during the height of the Adventure Team period of GI Joe. Like most, I was always fascinated with the action and realism that was portrayed in the box art. Now I know this is going to sound like heresy to some of you but I always thought the Joe inside the box never measured up to that high adventure portrayed on the box. He always seemed to have this expressionless face that lacked the tenacity, fear or any emotion that the artwork captured. Don't get me wrong, I still have a great affection for that little guy and have all my original Joes from 40+ years ago. Wouldn't part with 'em. These days, as an adult collector, I do seek to throw in a bit of newness to my collecting, selling and other Joe oriented activities. There were a lot of improvements made to Joes in the 90s & 2000s. My favorite head sculpt was one which I refer to as "Goatee Guy." Some of you may remember him in rebooted "White Tiger Hunts" & "Mummy's Tomb" releases. Although I have used a few others, I felt that his head sculpt presented a certain "angst" and tension that the original AT lacked. However, I wanted a more traditional beard & flock than "Goatee Guy" could offer. That's where Ray came in. 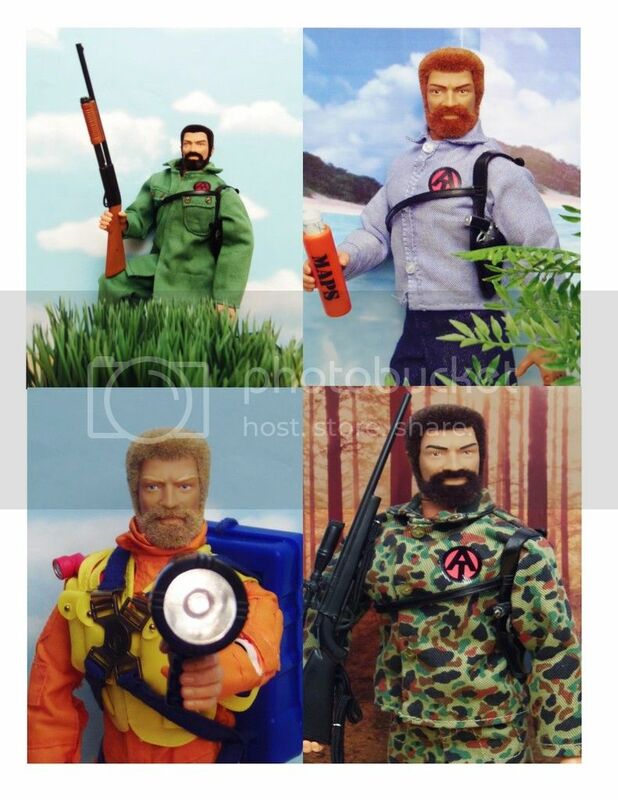 In the photos below, all the Joes are his reflock work. To me, they really represent how Joe should be. Just my two cents. In the photos, I also took a little extra effort to give some background & sometimes foreground to add an extra touch of realism. Craft stores are an excellent place to purchase a few extra items, without busting your wallet, which add an extra punch to your photos. This works especially well if you're a dealer and sell Joes in online venues, etc. You'll note the first photo of the commander kneeling down in a patch of grass with a skyline behind him. I purchased those two items, with my missus 50% off total purchase coupon, at a craft store for next to nothing. Yet, with just that, the picture has a much more powerful impact than otherwise. The one with my "White Tiger Hunter" has an old Marx Playset Mountain behind him, yet looks convincing as a distant peak. I have used pieces of drift wood in some photos displayed as fallen logs, etc. My Deep Sea Diver photo is actually outside. You can let your imagination run wild and there's no limit to what you can do in creating exciting scenes like the box art did for us in the 70s. Try some experiments on your own and you'll be surprised how much fun it is to give your photos a more realistic edge.